A little surprise can brighten a day | Be Nice. My honey and I recently got hitched. It was a pretty great time, and we were blessed with a huge amount of family support. One of my favorite things was the advice that I was “showered” with for my bridal shower. All my aunts and grandmothers wrote me little tidbits of advice for a long happy marriage. My grandparents have been together for 55-60 years each. My aunts and uncles, 30 or so. What was great about the advice was the surprise that my husband and I already do some of the things. A few times this year, I’ve been taken away on trips–one for business, one for family. We spend a lot of time together, as we have worked with one another (so to speak) for three years. When I left both times, I had the opportunity to slyly leave Jake little notes for him to find later. 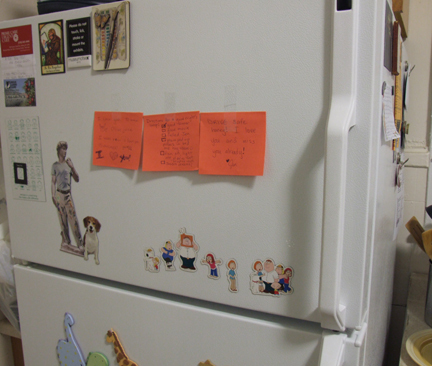 A note in the coffee can, one on the TV, one on the computer, in the shower, on the fridge. Each one said something different–something sweet, cute, funny, and dirty (of course!). It was fun for him to find all the notes while I was gone–especially when one was evading him even upon my return! Little things like that show a person you are thinking about them. 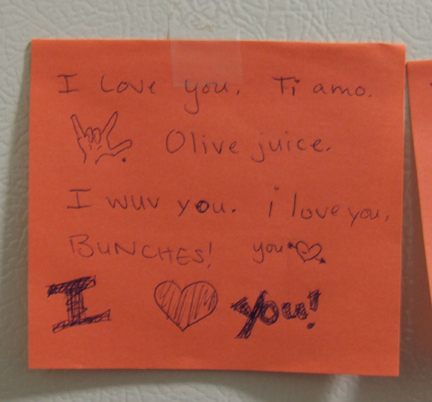 Thoughtful notes now and again, out of the blue, can really strengthen a relationship and keep it fun and interesting. Who knows what a well-placed and cleverly timed note could do for a marriage? This entry was posted in More ideas from Be Nice., With Others and tagged Attitudes, Conversations, happiness, marriage, rewards by Jen. Bookmark the permalink. Good idea! I think I’ll try it!